A beautiful adult specimen in the Maldives. - Singing the Powder Blues? 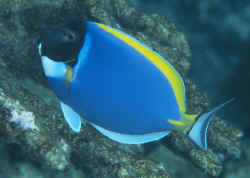 - Hi Crew, I need you opinion regarding whether I should be concerned about my power blue tang. I just noticed a small grayish patch (appears similar to mildew or a bruise) near its tail (see attached close-up picture). Typically this would not concern me but I did have a previous powder blue tang that had a similar area that continually expanded until the fish rotted-away. This previous powder blue tang did have other health issues as it's fins were rotting, it had a reduced appetite, a cloudy eye and a near-complete loss of coloration. 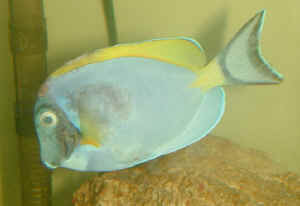 This previous Powder Blue tang died in my quarantine tank so the fish in my display tank were never exposed to it. <Understood.> I have had this current powder blue tang for over three months and it has always appeared to be very healthy. As you can see from the "full-fish" picture, it appears well (at least to me). I am just concerned of the possibility that this gray/black patch could be the same problem (just in an early stage) my previous powder blue tang died from. My water parameters are: Temp: 78 deg F, Salinity: 1.0235, NH3=0, NO3=0, NO4= 5 PPM, Ph=8.1, Ca=380. Does the attached picture provide enough detail to diagnose the problem? <Yes and no.> Should I be doing anything to address this? <Well... I've seen a couple of the lightly colored tangs that are able to turn dark in spots... and it's not always related to their night/fright pattern. 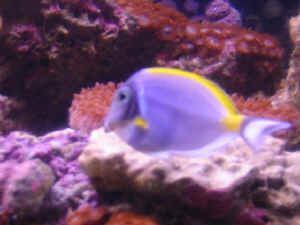 I'm thinking of a Unicorn Tang I took in trade that had some spots not unlike the ones you describe and what appear in the photos. The back spots continued long beyond the fright pattern, but did go away on their own in a couple of days. I don't know what those spots were but do think they are related either to color alteration like night/fright or a sign of stress or both. Not certain this is what's going on in this case, but it's worth just keeping an eye on things for now, make sure it is still eating well... get ready to treat just in case... get the quarantine tank fired up.> This fish is in a 180g tank with 200 pounds of rock so catching it is nearly impossible. <Actually not... three 50 gallon Brute trash cans should do the trick. 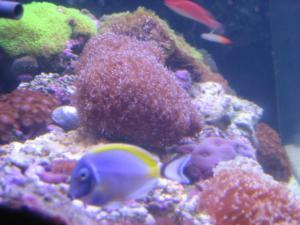 Use a one inch drain hose and siphon the tank into the cans... put some of the live rock in there, put others into bins. Once water is down to eight inches or so, just scoop the fish out and refill the tank. But don't think you're at this point yet, but do consider giving the fish a pH/temperature-adjusted freshwater dip on the way into quarantine if you do end up having to catch it.> Thank you for your help!